Wet is the best way to describe this year’s Christmas Bird Count (CBC), as were most of the CBCs in our area. 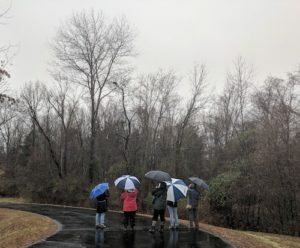 A few days before the Central Loudoun count 120 people were signed up to participate in the count but with constant rain in the forecast that dropped to 92. The day of the count began with rain but let up about 9 a.m. for a few hours. During that short time and in spite of many trails being closed because they were impassable, the birds came out, and when the day was over we had tallied 92 species and 28,870 individuals, about average for both. 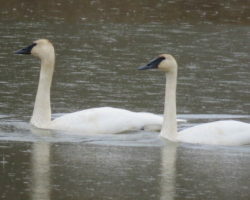 Two species never before observed on this count were seven Trumpeter Swans seen and photographed on a pond in Aldie and a Cape May Warbler seen and photographed a little north of Leesburg. Other rare species which have only been seen once before on this count were a Cackling Goose and a juvenile Iceland Gull. The latter was seen at the consistently productive County Landfill along with two Great Black-backed Gulls and three Lesser Black-backed Gulls. Because it wasn’t observed on the day of the count the Baltimore Oriole visiting a feeder in Lincoln isn’t part of the 92, but since it was seen the days immediately before and after the count it is considered a Count Week bird. The 37 Bald Eagles observed on this count has only been topped once before and the 17 American Kestrels seen was the highest seen in the past five years. Two teams, fewer than usual, found all seven of the woodpecker species that over-winter here. Other highlights were the 500 Common Mergansers seen on the Beaverdam Reservoir as well as two Common Goldeneyes found elsewhere. Always interesting are the major decreases for some species in the count. 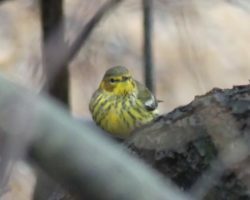 For the second year in a row none of the teams found an Eastern Meadowlark and very disturbing was the lack of Carolina Chickadees and Tufted Titmice (57). 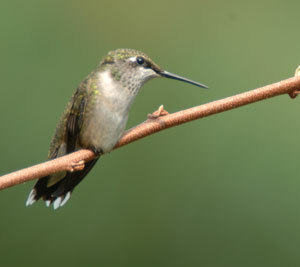 Last year’s 321 Carolina Chickadees was the smallest number in 10 years but considerably larger than this year’s 126. And this year’s 57 Tufted Titmice was the first time this species has been found in only double digits. Hopefully both are aberrations and their numbers will increase in the near future. The 30 people who turned up for the Tally Rally shared stories about what we’d found and missed and enjoyed a great and filling meal catered by Mama Lucci’s. 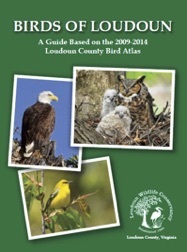 Everyone was excited as Spring Ligi described and showed some sample pages of the upcoming Birds of Loudoun County; A Guide Based on the 2009-2014 Bird Atlas, which should be printed and available for purchase in the next couple of months. The number of copies we decide to print will determine its price but it will probably be between $30 and $40. At this point we are looking for sponsors to offset the printing costs and anyone who donates $75 or more will receive a copy. See our totals and how they compare to previous years here. The Loudoun Wildlife Conservancy thanks the many participants as well as the numerous landowners who gave us permission to visit their properties. Without both this count would not be possible and we wouldn’t have this snap shot of what is happening with birds in Loudoun in early winter. Hope to see you next year – it’s not too early to pencil December 28, 2019 in your calendar!